i think i got it..
can some one please check if i am right with chages at the 032CA file, please? If you did it correctly the engine will run. If you didn't it won't. Yes, but very very rarely. In EEPROM change 69 C1, A5 to 8E 5A, D2. On page 01 and 02. This approach works on pretty much everything. Technically if WinOLS is correcting checksums you can only do the EEPROM. The first patch is to check checksum when ECU is powering up (IGNITION ON). The EEPROM mod is to disable checksums while ECU is running, which is the really important part. The above hex values could not be found on the ST10 (ME7.1.1 G). Is that expected? Just checked ME7.8 from Porsche, based on ST10 - it looks exactly the same, but the code is located in MPC. Did you dump both the MPC and flash? You could also try searching for "47 F8 55 00 EA 00" in case it's already patched for some reason. I have attached my FIle with Patch. What am I doing wrong ,I can not work with the engine running with OLS300. Yes I have, Have the Current CHKS. Therefore I Wolte with the patch the CHKS examination shutdown. Unfortunately, I have not understood the EEPROM, Flash Solte agree? Could that please view someone? The instructions are extremely simple. If you can not follow them, I do not understand what business you have tuning cars. Could you please tell me to help? My A3 always dies when I make a change to the OLS300. In FLash should agree I suppose. Would it be possible that me someone please help? Unfortunately, I can no assembler code. Now I have often tried to no avail. This has nothing to do with assembler code. It's a plain instruction. If you get even the easiest things handed to you, you won't learn much. 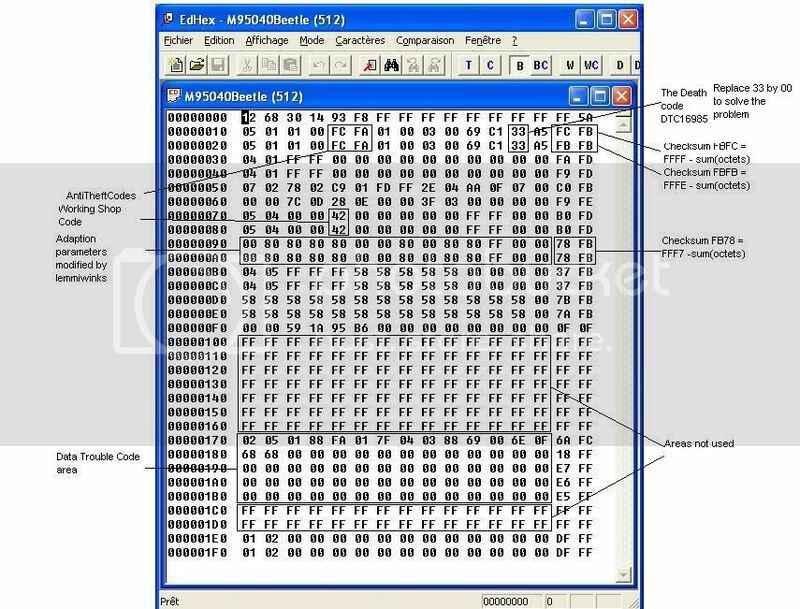 It means that you have to replace those HEX values 69, c1 a5 with 8e 5a d2 on page 01 "first line on a hex editor" and 02 "second line of the hex editor". In order to understand the eeprom search a little bit on this forum about the structure and the data pages.on 95040 there are 32 pages 0 - 31 .
what winols version u use?